Cargo Velocity helps customers to refine the operating requirements for their facilities and develop a procurement strategy tailored to specific situations. This may include preparation of a Request for Proposals (RFP), or negotiation support with preferred suppliers. In the case of an RFP, we support every stage of the process including drafting, distribution, scoring vendors, negotiations, and contracting. 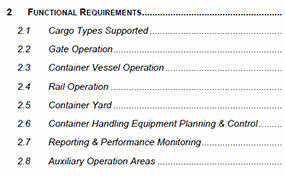 Tropical Shipping engaged Cargo Velocity in 2014/15 to formalize the RFP process in its search for a new TOS. "We knew we were doing our job when Tropical personnel said that they felt we were as knowledgeable about the requirements as any member of their team." In consultation with the terminal team, Cargo Velocity compiled and drafted a comprehensive RFP report and vendor questionnaire. After applicants responded, Cargo Velocity evaluated the results, and provided vendor profiles, technical content analysis, financial comparison of proposals, customized scoring criteria, and weighted rankings. To support Tropical in the selection process, Cargo Velocity consultants drafted follow-up questions for applicants and attended vendor presentations.